"Mike Sonko yesterdays' interview will cost him in the Nominations." says political analysts. - Bana Kenya News, Real African Network Tubanane. Home Nairobi "Mike Sonko yesterdays' interview will cost him in the Nominations." says political analysts. "Mike Sonko yesterdays' interview will cost him in the Nominations." says political analysts. Following The Nairobi senator Mike Sonko yesterday mentioning Peter Kenneth (PK - Chewing gum)as a corrupt person and unworthy for the Gubernatorial seat, Governor Dr Evans Kidero has said that all the Jubilee aspirants are not worth for the seat. According to Dr Kidero, the fight that is in Jubilee is because of selfishness not for the people and interest of Nairobi county. 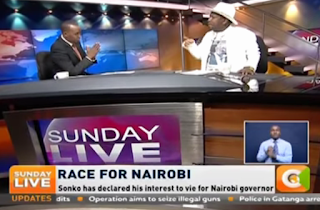 The interview that Sonko had with the citizen television host Hussein Mohammed showed that the senator has an inferior mind and lack leadership. The meaning of interview that he was invited for turned to chaos. His supporters today were very annoyed with what he said on the National Televison. "Mentioning people will take him anywhere because of them have direct intact with Jubilee party heads.That will cost him." Said a political Analyst. The game that the Jubilee people are playing against the senator will be known immediately after the nomination. The senator argued that the Team Nairobi supports him and he is ready for Nominations. The senator claimed that the presidential advisors are behind his fall after he was denied the certificate of good conduct later last week. The people of Nairobi are now looking forward to electing the best out of the many who are contesting in the next polls. According to the political heat on the ground, Dr Evans Kidero is still more popular and more strong compared to all other Candidates in the Nairobi race.